Teacher Preparation Report- UVa Rated Poorly, but Why? The National Council on Teacher Quality released a report this week on the quality of teacher preparation around the nation. That certainly would grabbed people's attention but maybe that was the point. Less than 10% of the programs were rated received 3 stars or higher. 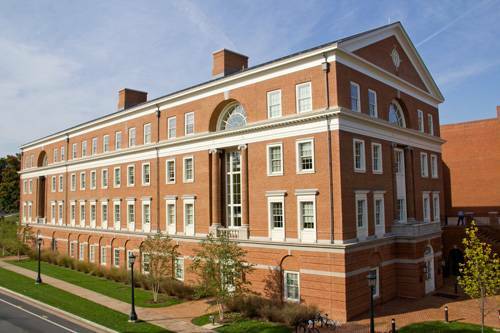 UVa received 1.5 out of 4 stars in Secondary Education. So what does that mean? A question with no easy answer. A better question is should that rating matter? Yes but only a little. Most media will report on this with some attention grabbing headline making UVa or other schools look bad then move on. What's more important is to recognize the purpose, scope and use of the report and then give it some context. UVa is an outstanding institution and attracts some of this state's and nation's top scholars. One must assume that the pool of teachers it produces are also of outstanding quality. Having worked closely with many of these individuals and observing them both as student teachers and later once they joined the workforce, I have found they are well prepared for the job. Some are as not quite as good as others but it cannot be an accident they enter our school ready to roll and versed in what to expect. I believe that one can never really be "ready" for the first time you are on your own teaching your won students and all that means but if I had to choose who to hire, knowing they are a UVa Curry School graduate would provide a great deal of confidence. "Through an exhaustive and unprecedented examination of how these schools operate, the Review finds they have become an industry of mediocrity, churning out first-year teachers with classroom management skills and content knowledge inadequate to thrive in classrooms with ever-increasing ethnic and socioeconomic student diversity." So what you are saying is they stink? The stated purpose for this report is "providing information that aspiring teachers and school leaders need to become strategic consumers and that institutions and states need in order to rapidly improve how tomorrow’s teachers are trained." The authors of this report have what seems a laudable goal but a funny way of achieving it. It proceeds to beat up just about every institution and would seem to do more to undermine confidence in these programs rather than to foster improvement. Maybe that is the intent? It focuses in on how programs hold up to a narrow list of predetermined criteria. Many of which might indicate the NCTQ has an agenda for certain reforms and wishes to push schools in that direction. What's less apparent is whether or not that agenda mirrors that of other corporate style measures often linked to such critical reports. The TUs executive summary of the report would read something like this: "Eh." Linda Darling-Hammond had a bit more to say and called the whole thing "nonsense" She is not alone and there is also no shortage of other critics of the NCTQ or this study. 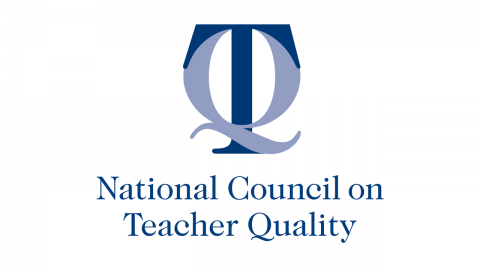 When word broke that U.S. News was planning to rate teacher preparation programs and would rely on the NCTQ to produce those ratings, 35 chief academic officers from the education schools of the Association of American Universities signed a letter adressed to the magazine's editor expressing concerns about the methods being used. That ought to say something about context. OK, so clear the NCTQ thinks all but 4 are bad. If I were brutally honest I'd say that this is one of those reports from some group of think tankers who seem to exist solely for producing such reports. A lot of time and energy went into this and it is not totally baseless, probably even has some merit as a tool for improvement. But as a teacher I don't have much use for people who don't truly understand what we do and like to spend time explaining what we need to change. They seem either disinterested or too busy examing education on paper to bother getting boots on the ground and engaging with teachers and people in schools. Maybe that is too dismissive but it is a position built on long experience with reports and reformers. I'd point out that they didn't visit the schools they rated, didn't look at how teachers produced by schools were performing in their job and didn't really do much in terms of providing real world substance to back up their low ratings. But they probably sold some magazines and generated some web traffic. Is UVa Doing a God Job? Yes. I've cooperated with 3 student teachers and 5 or 6 practicum students from UVa over the years. Without exception they were enthusiastic, hard working and willing to learn. Professionally they were about as well prepared as one could be in terms of methods and pedagogy. That together with UVa's solid content programs meant they were they were much farther along than I was in my own career at that point. UVa has a an strong reputation in our community and is known for turning out some of the best educators around. The Curry School students I encounter are as ready as they can be. It is true some are better than others and some will not choose to remain or even stick with teaching. Even people at Curry would ackowledge the school has flaws and room for improvement. But students there are given every opportunity to succeed and that is thanks to the knowledge, skills and experience afforded to them through proven methods. Curry is proactive and innovative but stays grounded where the rubber meets the road. So to place stock in a rating of 1.5 out of 4 is kind of silly. So why the lackluster rating? The report doesn't really assess performance. It instead looked at a slate of criteria centered around the Curriculum, Syllabi and Admissions process of these institutions. The report stated "we are setting in place market forces that will spur underachieving programs to recognize their shortcomings and adopt methods used by the high scorers". This is a very telling statement and reveals that the report is an effort to spur action. The NCTQ seems to suggest things be done a certain way. And the only way to improve is to cater to the criteria being rated. The goal of any teacher prep program is to prepare new teachers for rapidly changing reform oriented professional world they will ener. There's simply is no way to standardize how to effectiveley do this. Nor should there be. Schools should constantly assess what they teach, how they teach it and ways to improve. But undermining their support doesn't and won't aid them in that process. Any report worth a hoot would connect what it measures to program quality. A whole bunch of things but they are hidden under and avalanche of data and useless findings. Sometimes the larger something is the less productive it is. The main things measured all fall under four main headings. These are provided here in abridged form and only the ones that apply to secondary appear below. I've omitted the ones applying only to elementary or special education. Selection Criteria- The program screens for academic caliber in selecting teacher candidates. necessary to successfully teach to the Common Core State Standards. Classroom Management- The program trains teacher candidates to successfully manage classrooms. Lesson Planning- The program trains teacher candidates how to plan lessons. Student Teaching- The program ensures that teacher candidates have a strong student teaching experience. Outcomes- The program and institution collect and monitor data on their graduates. Evidence of Effectiveness- The program's graduates have a positive impact on student learning. That stuff is important. A quick review of the list makes clear that these things are great in principle but there is a disconnect to the list and whether or not the program produces people who can teach. Sure raising the bar in terms of candidates and asking more from them iare tough to oppose but this is not a scientific process. Schools and classrooms are dynamic environments and you need a great deal more than content and pedagogy to be successful and effective. In our data oriented world I trust my eyes and my mind when I see someone work with students. While studies and efforts intended to help better prepare future teachers are welcomed, the way it is currently being done, as is the case with the NCTQ, are not and do little to help prepare educators. The National Council on Teacher Quality advocates for reforms in a broad range of teacher policies at the federal, state and local levels in order to increase the number of effective teachers. In particular, we recognize the absence of much of the evidence necessary to make a compelling case for change and seek to fill that void with a research agenda that has direct and practical implications for policy. We are committed to lending transparency and increasing public awareness about the four sets of institutions that have the greatest impact on teacher quality: states, teacher preparation programs, school districts and teacher unions. Several years reading and researching reform movements have heightened my senses. This report and many similar headline grabbing reports from the NCTQ emit echoes of corporate, profit driven, top heavy national policy reform that has done little to advance education over the past decade. What is has done is likely the same as what this report will. Undermine the very people doing all they can to help students. The NCTQ even recommend capping the number of licenses issued in each state. Yep they want to reward stronger teacher prep programs by allotting them more licenses. "Programs would not be prohibited from admitting as many candidates as they choose, but they would not be able to assure candidates that a license and job in the state will be waiting for them." Teaching is collaboration not competition. The NCTQ doesn't get that. Efforts to train highly effective teachers and promote teacher quality shouldn't do the opposite. Teacher training matters. But I don't think this study does. My advice to those seeking to pursue a career in education and doing so at one of these instittuions is don't pay too much attention to all this white noise. Instead put your back, mind and heart into the hard work of getting ready to be a teacher. Because it doesn't get any easier once you start. Al these schools are not created equal. But if you find the right one for you and focus on making the most of your time there, you'll be just fine. And if enough people like you continue to do just that, then the nation will be fine too. It’s Not What You Are, It’s Who You Are. That is a message I repeat time and again to the students and athletes I work with in my job. I remind them that WHAT you are can change at any moment, WHO you are does not. We’ve sent our graduates out into the world equipped them with what they need to accomplish amazing things. More important to me is how we have contributed to who they have and will become. Which bring us to the summer. I’m terrible at golf. If the members of the TU are anything, it is horrible at golf. 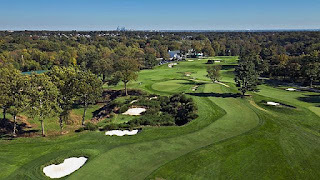 As we begin our summer break, the 2013 U.S. Open is taking place at the East Course at Merion Golf Club in Ardmore, Pennsylvania. Those who make a living playing professional golf are living the dream, or nightmare depending on your perspective. This year’s open venue seems to be making it more of a nightmare and promises a wonderful finish. When I watch golf I take a lot of naps. Not because I am bored. In fact I am fascinated by pro golf . And one player fascinates me more than any other. Tiger Woods. I love to watch him but have never been a huge fan. Not because of his golf. He's an amazing athlete and competitor and in some ways bigger than the game. If you need evidence of how Woods transcends golf I remember when my daughter was 3, she knew of Tiger Woods and asked to watch the Masters. He’s a legend. But I never really liked Tiger because of how he acted. And with Tiger there’s a “but”. I try not to be a hater but there is something else in the room besides his on course behavior when discussing Tiger. Yep. It’s that. Tiger is and to some degree has, always acted like a jerk. His actions while married are inexcusable and deplorable. No matter what he wins and does as a professional it will and should be there. To me he just doesn’t seem to get it. They are both really good at golf. That statement is true of far too many professional athletes who measure their lives by WHAT they do. They become so driven by success and what they want to be. They tend to forget who they are becoming. The spotlight of the media and scrutiny of public life cannot be easy things. But people given such gifts, no matter how hard they work for them, should never take them for granted and as public figures should accept the additional burden of their impact on others. Teachers and coaches get this. It puzzles me why so many pros don’t. Even though the news seems to probe for their missteps and are presented with a wealth of opportunities, many athletes serve as great role models with who they are. Enter my favorite golfer. “Lefty” also known as Phil Michelson. He’s a golfer. He’s classy. He’s a great person. He’s a great role model. While his resume at majors doesn’t quite stack up to Woods 14 so far, “Lefty” gets my vote for WHO he is. 2006 US Open, Michelson reacts with the Double Bogey. I know neither player well and admit to having no sound basis for judgment save their public actions. 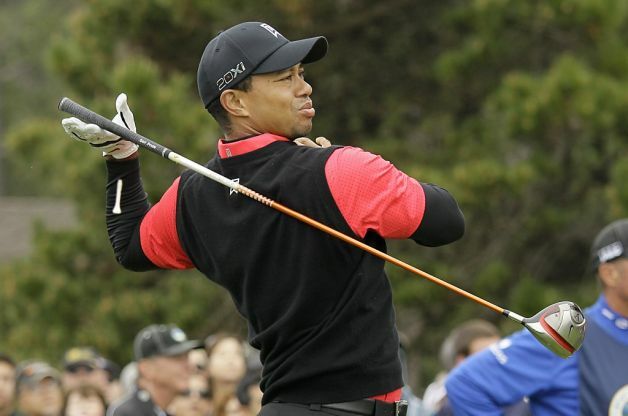 If you look solely at raw talent, Woods may take the lead, but off the course it is no contest. What I mean is that Michelson distances himself in the things that should matter most. In 1999 Michelson wore a beeper and stated outright that if it went off during the U.S. Open, he would leave to be there for the birth of his child. Fourteen years later that same child is graduating from the 8th grade and on the eve of the 2013 US Open he flies back and forth across the country to hear her speak at her ceremony. He’s finished 2nd in the US Open 5 times. He has given the lead up late and I remember when he gave up the lead in 2006 with a double bogey on the 72nd hole and what did he do afterwards. Throw his clubs? Curse? Avoid the media? No. As a window to who he is, he made a point to apologize to his supporters. Lefty is in contention this year. Do I want him to win. Yes. Will I be sad if he doesn’t? No. We can all struggle with personal relationships and I don’t mean to pick on Tiger. But it is tough to forgive some things. Mostly the WHO type things. I admire Ben Hogan who knew all too well how quickly the WHAT can be taken away. His horrific car wreck in 1949 was supposed to keep him from walking let alone playing. Inspired by letters from people who cared WHO he was, he went on to play and win as he continued his epic career. 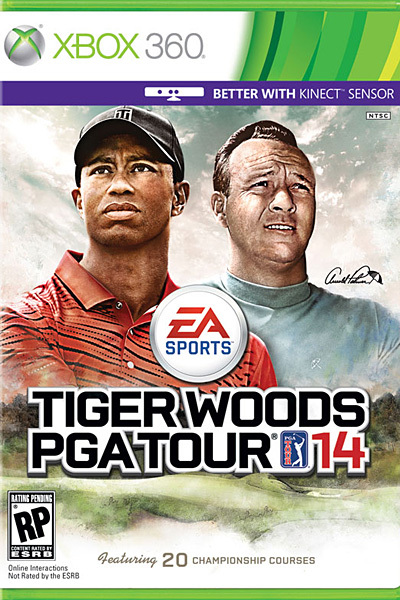 Another guy I admire is Arnold Palmer met and traveled with his wife on tour why I find it ironic that he and Woods appear on the cover of PGA 2013. We can't forget the Golden Bear Jack Nicklaus. Watching in 1986 when he won with his son on the bag. Wow. Those guys care about WHO they are first. 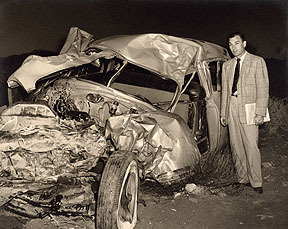 Hogan was struck by a greyhound and threw himself in front of his wife during the wreck. As we all continue to watch the tournament play out we will no doubt treated to some pretty dramatic moments. Let’s remember a few things. #1 I am terrible at golf. #2 As we cheer them on by yelling obnoxious phrases when they tee off or salute them arriving on the green be sure we appreciate who they are as much as what they do. #3 During those goosebump inducing video montages steeped with history and emotional music give some pause to WHO the great figures of golf were and what they meant to the sport and the people in it. #4 Whoever wins will be a US Open Champion. That’s what they’ll be. While the title is theirs for now, next year there will be another champion taking their place. What will always remain with them is who they are. When they play their last tournament they’ll walk away and have to live with who they are and that's what will matter long after the cheers of the gallery fade. They'll be competing on Sunday. The schoolyear has come to an end and my students have headed out my classroom door for the final time. 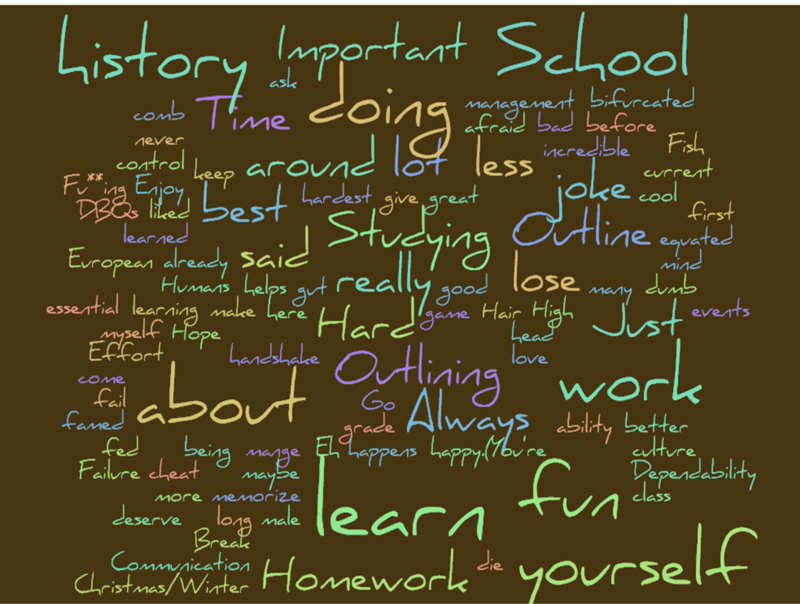 As I grade finals, tie up loose ends and endure the new Virginia Teacher Evaluations as part of our TPA(Teacher Performance Appraisal) I took a moment to consider what I have really taught my students. 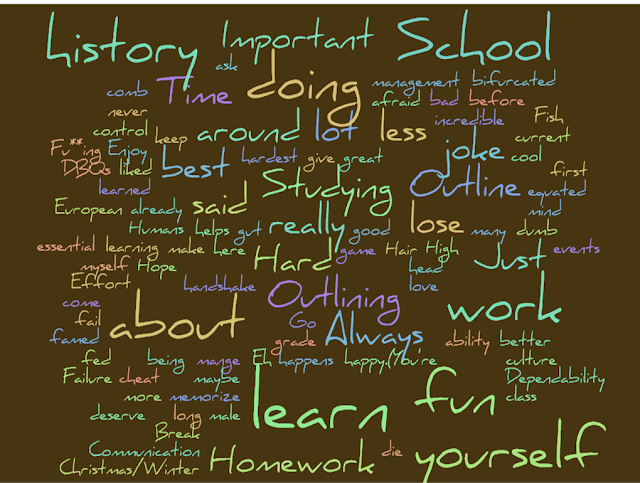 "What was the most important thing (if anything) you learned from your teacher this year(may be something other than history)?" Absent context these might seem a bit odd but as part of a larger yearlong effort and fit into all that time working together they make complete sense. Some students always choose not to answer but those that do provide funny, sometimes puzzling and often profound responses that make me feel like all my efforts are worthwhile. I liked how you said “think” I never really started doing that before. Studying gets you the grade you want, or deserve. I learned to be less serious about schoolwork. That sounds bad but it really equated to less stressing about school which is a good thing. Too many profound quotes are swirling through my head to pick just one. Fish can survive throughout the WHOLE Christmas/Winter Break w/o being fed. Do not memorize, learn to understand. Hair is cool. Hope. I learned to hope. There are 3 questions we should ask ourselves: Where did we come from? Why are we here? What happens when we die? If you lose your culture, you lose yourself. How to give a great handshake. I'll also take some time over the summer to share some traditional responses from previous students so keep an eye our for Part II. You laugh, you cry, and you work harder than you ever thought you could. Some days you’re trying to change the world and some days you’re just trying to make it through the day. Your wallet is empty, your heart is full and your mind is packed with memories of kids who have changed your life. Just another day on the classroom. Something most people controlling education- not in front of kids every day- either can no longer or never did understand. Hard to believe but the 2012-2013 school year is almost a memory. Today marks the final time we rejoice as all teachers do that it is Friday. The end of school is a time of great change. A chance to take stock of what you have and have not accomplished during the year. F It is the time of year we usually finally get a contract from the division with numbers on it and maybe two days to think before signing it. It is also the time we bid goodbye to a group of young people we've come to know pretty well ovet the last 9 months. Bittersweet. Indeed. But that's the job. What else is bittersweet besides the last Friday of the school year? Glad you asked. 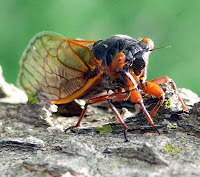 We all waited for 17 years for this brood to emerge and at least at my house, they did not disappoint. Their collective call is almost indescribable and one I am glad I was able to experience again. Their sound and numbers are simply staggering. Think of how different the world is from when they entered the soil, and how different it will be when their descendents re-emerge. Now, having lived out those precious few weeks they waited so patiently for, they seem resigned to their fate. Though their red eyes appear unchanged, a closer glance reveals an all knowing expression and a dignity not there before, one awaiting their end. As the numbers who have expired on my driveway continue to grow, it is sad. Or bittersweet, so I am told. Once AP Tests, SOLs and Graduation arrive...school just kind of fizzles out. Like cheap firework. It's go -go- go- fizzle. How unfortunate it is that the days of engaging and interesting activities serving to tie everything together have been undermined by all the crap we have railed against on this blog. Also it is bittersweet because we all get burned out by the hectic push to the end, only to have the end not live up to the billing. I guess it is about the journey not the destination. Kind of how the other days of the week being what makes Fridays so special. We are saying goodbye several great faculty member. We do so at a seemingly ever increasing pace. We are so jealous....I mean happy, yeah...happy for them but will miss them. Well, most of them if we were being honest. Some are retiring, some moving to other teaching jobs or schools and some just getting out of the game. As they leave us behind and go on to other things it goes without saying. It is Bittersweet. There are still a few student who take the time to write a little thank you. Some of these students even mean it. I got one this year from a student who hasn't been at our school for two years. That goes a long way. The bittersweet part is that these grow increasingly rare. So it the final Friday. It is not over. But we are close.